Back in March, Nvidia announced the GeForce GTX Titan Z, a dual-GPU card packing two Kepler GK110 dies and a whopping price tag of $3,000. Originally this graphics card was supposed to launch at the end of April, but it mysteriously missed this time frame and hasn't been sighted since. Until now, that is. 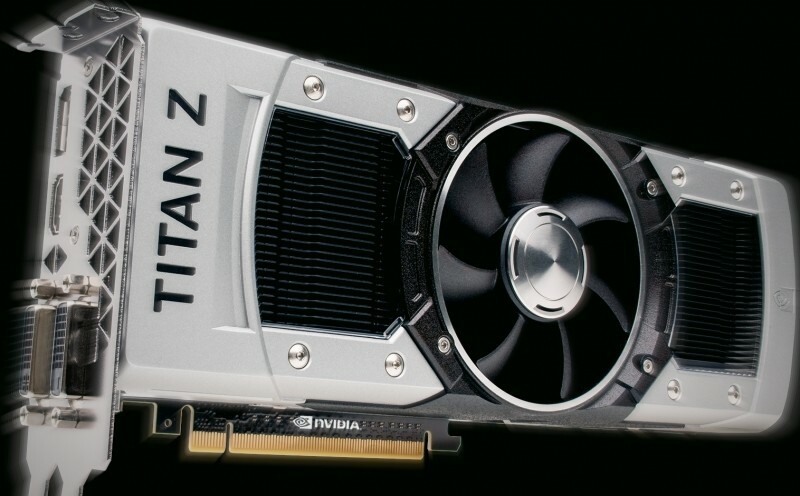 Nvidia is finally ready to officially launch the GTX Titan Z, with the monster card set to be available at retail and in pre-built systems in the next few days. Since the announcement nothing has changed about the card: it still costs $3,000, it still comes with 5,760 CUDA cores (2,880 per GPU) and a maximum clock speed of 876 MHz, and it still packs 12 GB (6 GB per GPU) of GDDR5 memory clocked at 7 Gbps. The TDP is expected to be somewhere around 375W for this card, although it could be higher considering the two powerful GPUs situated underneath the air cooler. You'll definitely need a powerful PSU to run this card, as you would if you went for an SLI or CrossFire setup. Nvidia says the GTX Titan Z will be the most powerful graphics card the company has ever created, and by essentially packing two GTX Titans onto the one board, there's no doubting this will be the case. At $3,000 though, it might be a hard sell up against AMD's dual-GPU card, the Radeon R9 295X2, which is mighty powerful and costs just $1500.